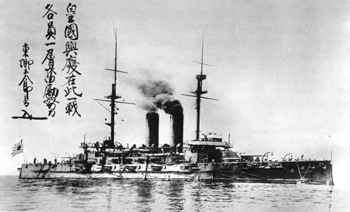 In the Russo-Japanese War, the battleship "Mikasa" was a flagship of a Empire Combined Fleet. (present Muroran Factory) Zuisen Sword Workshop, swordsmith. guns, and forge the Mikasa sword during January, 1928 - May, 1932. The Mikasa swords were forged 229. The grade Kō Mikasa dirks (It is with "the fate of a Japanese Empire is decided by this battle" sculpture were forged 973, and the grade Otsu Mikasa dirks were forged 451. And it was sold through "Suikōsha". party(Kamikaze) real parent and Vice Admiral Takijiro Onishi used regularly. of only the steel for guns and a forging rd-steel) together. "The fate of a Empire is decided by this battle"
carries the Naval Academy cadet's Mikasa dirk. He emigrated to Muroran from Tōkyō by invitation of the Japan Steel Works. He will enter in July, 1918. Zuisen Sword Workshop opened in August, 1918. 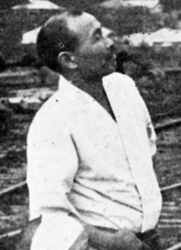 Hideaki Horii died in October, 1943. Kaneaki and Toshihide are members. He was a swordsmith representing Japan of prewar days. A navy royal gift dirk and Toshihide. The Mikasa dirk and Hideaki. 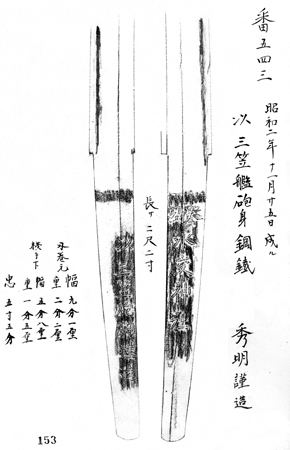 Mikasa sword presented to Admiral Tōgō by Suikōsha. 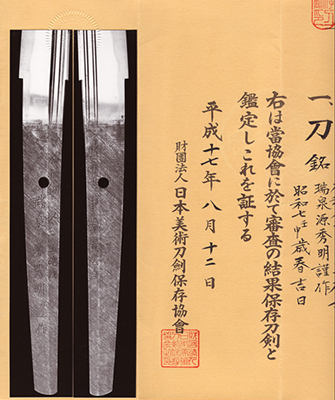 to Japan Steel Works Zuisen Sword Workshop's Hideaki Horii swordsmith in 1932. The Kissaki side has a fuller. 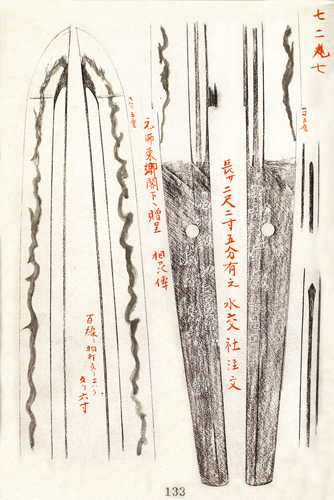 The Habaki side has an engraving of the sword. 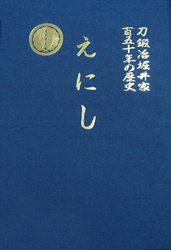 The Oshigata recorded on Zuisen Sword Workshop. This sword is presented to a Fleet admiral Tōgō. 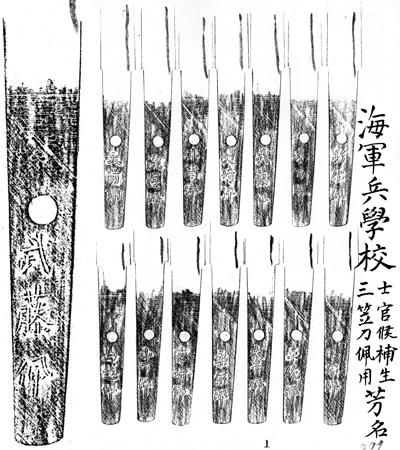 The duplicated drawing of the swod-tang written in the bond of the Japanese fine-arts sword preservation association in 2005. ↑ The mounting at the time of presentation is unknown. News of this Mikasa sword. Mr. Satō was carrying out the return activities of the Japanese sword requisitioned by the U.S.
Mr. Satō had a marshal's Nimitz to a fleet admiral Tōgō's Mikasa sword, and other swords then entrusted. The transition ceremony of the requisition Japanese sword was held in the National Museums of Ueno on September 28, 1960. 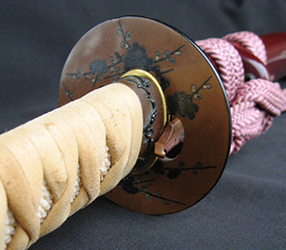 The Mikasa sword was returned to Mr. Itagaki (MIKASA Preservation Society director), the owner. A marshal's Nimitz is known for having continued carrying out whole life worship of a fleet admiral's Tōgō.